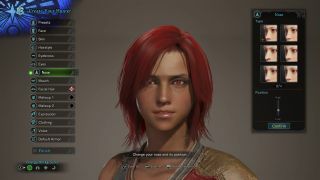 Over the weekend, Monster Hunter World players experienced a longstanding truism among games with custom protagonists: the face you spend tons of time scrutinizing and perfecting in the character creation screen is often not what you end up with in the game world. Users have been posting about the disparities between the high-res customizable faces and the in-game results, lamenting a perceptible downgrade in quality. Granted, this is something that pops up in just about any game with the option to tweak your hero's face. Developers often use higher resolution assets in character creation because you're looking at something up close, then scale that down for performance's sake once you're actually playing. And that makes sense. I mean honestly, how often are you going to be looking carefully at your character's face while they're grappling with a 30-foot dinosaur? And here she is in the game's hub area, with settings tuned to prioritize "graphics" in the first picture, and "resolution" in the second picture (these options are available when playing on Xbox One X and PS4 Pro - note that I do not own a 4K TV, so the resolution setting is still 1080p, but you can still see a slight difference). Not a huge difference, but I can tell her cheeks are a bit puffier, and her eyes a bit more relaxed. I was going for 'fierce tomboy,' but the in-game model looks a bit softer. Even so, I don't think the differences are significant enough to be a detriment. They're just noticeable, is all. Rotate the camera. This seems super basic, but when a game throws as many customization options as MH World does at you, it can be easy to get tunnel vision and forget. Check your character out from multiple angles so that you're not caught off-guard with a feature you don't like. Preview facial expressions. Unlike a fair number of games that star a silent protagonist, your avatar in MH World won't just stare blank-faced at everyone around them. They smile, they frown, they laugh and yell. You can get a sense for what each of these movements (and more) look like by tapping the "preview" button under the "Expression" option. Look at your characte§r under different lighting conditions. Down in the bottom left corner of the character creation screen are various background options, so you can get a better idea for what your character will look like in a wide range of settings. After all, you (probably) aren't going to be adventuring through a vast, gray void, so use these to see if your avatar's face casts strange or previously unnoticed shadows. Once you're happy with your hero's aesthetics, it's time to go hunting. Thankfully, we've got a few Monster Hunter World tips to help with that, as well as a more basic Monster Hunter World starter guide, regardless of what hair color you chose.